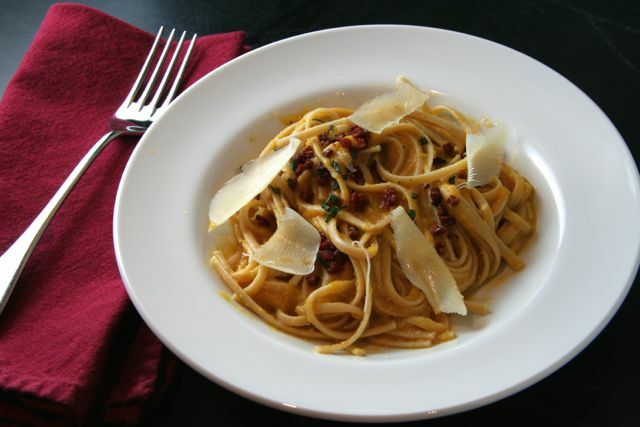 Like you husband, I love a carbonara, This sounds like a great twist on an old favorite. Thanks for sharing! Did I hear dinner party?!?! This looks delicious….hint hint! Ahhh I’m so annoyed! My wordpress reader has been playing up and unfollowing loads of my favourite blogs and it’s driving me mad – yours is one that it deleted and I thought today, I wonder why I haven’t seen any posts from the Brook Cook recently… damn you wordpress. Looks like I have lots to catch up on which is going to be fun – including this amazing idea! Thank you so much!! I have to check and see if any blogs have been deleted from my reader as well :(. I LOVED this dish by the way!! Let me know if you give it a try.